The Harvard Graduate School of Education (HGSE) made significant upgrades to Longfellow Hall that helped transform the building to better meet the current teaching and learning needs and position the school to advance the mission; Learn to Change the World. The project created a new 5th floor/penthouse addition, and made substantial improvements to the building infrastructure. The building had not seen any significant improvements since the 1940's and as part of the Longfellow Renovation the project team developed an implemented an infrastructure master plan aligned with the future vision of the building. This plan allowed for the development of the electrical switchgear and heating and cooling plants, installation of new systems on the 4th and 5th floors, and new vertical distribution throughout that can be leveraged when the lower floors are renovated in the future. New fire alarm and fire sprinkler systems were installed throughout the building and the project improved the accessibility of Longfellow through the installing a new elevator and upgrades to the entries. The project reorganized space on the 3rd floor to position the school to create two new 60 seat flat floor flexible learning spaces that can be combined to create one large 150 person classroom. 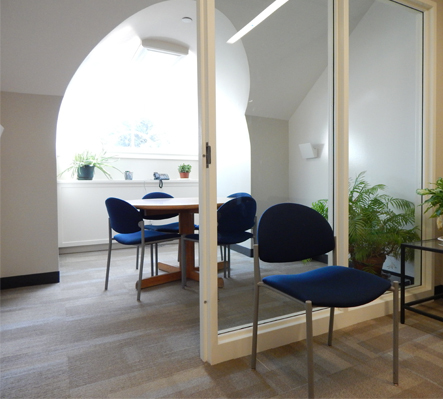 The additional space created on the 4th and 5th floors helped develop a more cohesive campus on Appian Way by supporting the relocation of HGSE's Executive Education Program and Project Zero from leased space to the main campus. The Longfellow renovation achieved LEED‐CI v3 Platinum certification.